Click on an image to view the larger version. View the next image with a single click or click Next. the size of the arrangement as well bloom choices. To see size comparisons, refer to page four. ABOUT FLOWER AVAILABILITY To help achieve the design or style you want, our floral designers will offer suggestions of seasonal or year-round flowers currently on hand. Certain flowers may be available for a limited time within a season. Availability and colours often vary from season to season. Tell us your thoughts and needs based on your personal preferences or in light of the images you’ve seen in these pages. 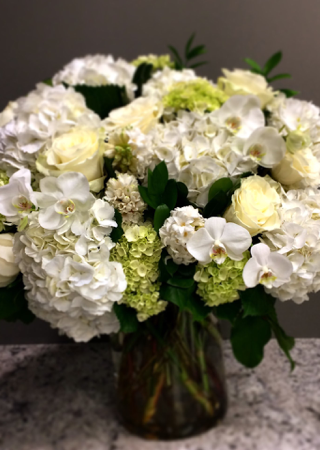 Call to find out more or drop in to see our flowers at 2847 Dufferin Street (Toronto, ON M6B 3S4).